He May have only used his 'golden ball' once in the dying stages of the day, but Eugene Ellis (pictured) proved to be the golden player as 'ping pong' came to Guernsey for the first time. Barry Hearn's latest brainchild - the World Championship of Ping Pong - has grown in stature year-on-year and here it was just as well received by the 32 Channel Islanders battling it out. But in the end, a busy day ended much as it had started, with Ellis - one of two visiting Jerseymen - dominating proceedings and booking his spot at the Alexandra Palace. 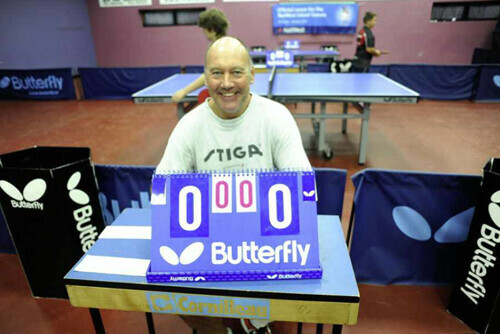 Guernsey threw everything they could at the 55-year-old Caesarean, but Garry Dodd and Paul Hainsworth were brushed aside in the semi-finals and then final respectively, both in straight sets. effect. Those two points earned in one rally gave him a 13-12 lead and from there, he saw out the set for a 15-11, 15-10, 15-13 triumph. Afterwards he was delighted to have proved himself as the CI's top hard bat player. 'I am over the moon, this is beyond my wildest dreams to win a tournament like this at my age,' he said. 'Throughout the tournament I only dropped one set [against Chaz Elliott], so it was slightly easier than I expected it to be if I am being honest. 'There were some very good players that I had to beat along the way and to nearly go the whole way through without using my golden ball was pleasing, too. 'I was hoping not to use it at all because I wanted to know if I was good enough to not use it, but at 12-11 down in the third set, I wasn't taking any chances. 'Paul is a quality player and I was in a position that I never thought I would be, so I wasn't going to risk it for the sake of not playing the golden ball.